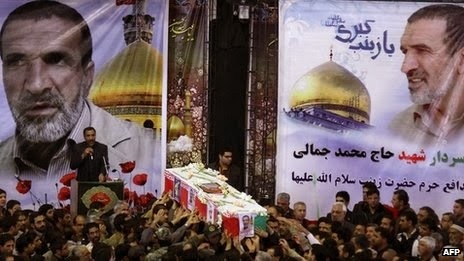 A funeral has been held in southeastern Iran for a Revolutionary Guards commander killed by rebel forces in Syria. Brig. Gen. Mohammad Jamali-Paqaleh was buried with full honors in Kerman. He had volunteered to "defend the Syrian people against terrorists" and "protect the [Shiite] holy shrine of Sayyeda Zeinab" in the southern suburbs of Damascus, the semi-official Mehr news agency, said. The area around the mosque revered by Shiites as the burial site of a granddaughter of Prophet Mohammad has been the scene of heavy fighting. Iran has invariably denied sending combat troops to support President Bashar al-Assad. Iran also provides billions of dollars of aid and an undisclosed number of military advisers to Syria. Iran’s cat’s-paw in Lebanon, Hezbollah, openly acknowledges its guerrillas are fighting for Assad, but Tehran denies its troops have been engaged directly in combat in Syria. "As we have said many times before, Iran has no battalions in Syria and only advisers are present to transfer their defensive experience to the defenders of that country," Sepah news agency quoted Gen. Ramazan Sharif, head of public relations for IRGC, as saying on Monday. Mehr reported that Gen. Jamali-Paqaleh was killed "in the recent days", without giving a specific date or location. He was a veteran of the 1980-1988 Iran-Iraq War, and trained at the same Guards facility as Gen, Qasem Soleimani, head of its elite overseas operations. "They will have to succumb to the rooted determination of the Iranian and other Muslim nations," he was quoted as saying by the ISNA news agency. Earlier this year, Iran lost its point man in both Lebanon and Syria. He was presumably ambushed and killed by Syrian opposition forces while travelling overland to Beirut from Damascus. Prominent Iranian clerics, military commanders and politicians led mourners at his mid-day funeral at a mosque in north Tehran on 14 February 2013. They included Hojatoleslam Ali Saidi, representing Iran's Supreme Leader Ali Khamenei, Revolutionary Guards chief Ali Jaafari, Quds Force commander Maj. Gen. Qasem Soleimani and Foreign Minister Ali-Akbar Salehi. The semiofficial Fars news agency identified the slain Revolutionary Guards commanding officer as Hassan Shateri. Footage of the service broadcast on state TV showed mourners carrying aloft a coffin with his portrait. Fars said Shateri was a veteran of the 1980s Iran-Iraq war, and served in Afghanistan before going to Lebanon. He was buried in his hometown of Semnan, some 150 kilometers east of Tehran. In Lebanon, Shateri posed as “Hessam Khoshnevis,” head of an Iranian agency set up to help rebuild Hezbollah-controlled areas of Lebanon devastated by the 2006 war with Israel.